The role of an Accredited Dyslexia Champion. - Right Resources ....for a thriving and productive neurodiverse workforce. The role of an Accredited Dyslexia Champion. Graduates of the DYSLEXIA CHAMPIONS™ training & accreditation programme are employees who contribute towards a ‘dyslexia/neuro-divergence friendly’ workplace culture. 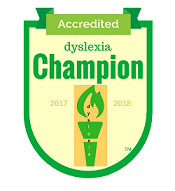 An Accredited Dyslexia Champion is an ‘approachable & knowledgeable colleague’. They have a positive influence on their colleagues and work environment. They continue to gain knowledge around the area of interest - dyslexia and associated ‘processing differences’ (dyscalculia, dyspraxia, ADD & ADHD) with continuous professional development (CPD) . These individuals appreciate the need for positive well-being - for colleagues and for themselves. They work with heart – and they are approachable, knowledgeable and impartial. They guide colleagues towards a recognised process of support. They provide an essential, safe 'gateway' for those who may have concerns about seeking support. They are equipped and able to answer questions from individuals and line managers. They can provide important initial dyslexia 'first aid' for those who are feeling overwhelmed and unsure whether they should mention their challenges. Through a course of study these individuals have acquired an understanding of neuro-divergent 'conditions' and the comorbidity (co-existence) of these. They appreciate the potential challenges faced by those who have little understanding of their own processing differences and/or no appropriate,tailored strategies or tools in place. During their studies they have enhanced their active listening skills and have an understanding of the potential impact dyslexia and other neuro-divergent 'conditions on well-being and mental health. Their accredited status is acquired through the completion of an Open College Network (OCN) Level 2 workbook assignment (accompanied by mentoring) which leads to a qualification endorsed by the British Dyslexia Association. Plus there is an opportunity for ongoing CPD which ensures they keep up to date and are able to continue to provide a quality service to those who approach them for guidance. Please note: These individuals have undertaken this course of study to guide their fellow workers or students, family and friends. This is not a public service. To find out what graduates of the programme have to say about their experience of the training please click here. Then if you would like to find out how you and your organisation can help ensure your dyslexic/neuro-divergent staff are accessing the support they need please contact us​.